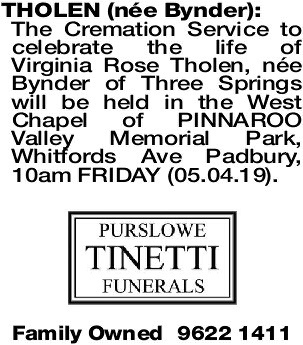 The Cremation Service to celebrate the life of Virginia Rose Tholen, née Bynder of Three Springs will be held in the West Chapel of PINNAROO Valley Memorial Park, Whitfords Ave Padbury, 10am FRIDAY (05.04.19). You held our hands when we were small, you caught us when we fell. The hero of our childhoods and latter years as well. Every time we think of you our hearts fill with pride. And though we will always miss you, we know you are by our side. In laughter and in sorrow, in sunshine and in rain. 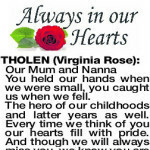 VIRGINIA ROSE Passed away peacefully at Northam. 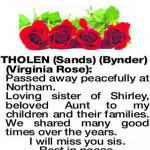 Loving sister of Shirley, beloved Aunt to my children and their families. We shared many good times over the years. 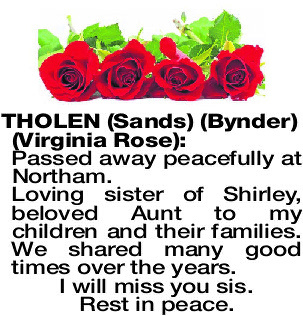 I will miss you sis. Rest in peace.